This document introduces the basic concepts of various Web performance timing specifications, including [[PERFORMANCE-TIMELINE-2]], [[HR-TIME-2]], [[NAVIGATION-TIMING-2]], [[RESOURCE-TIMING]], [[USER-TIMING]], [[FRAME-TIMING]], [[SERVER-TIMING]], and explains how these APIs fit together. This document is a collaboration of the W3C Web Performance Working Group. Most use cases in this document originated from the working group's past discussion, which was achieved in the group's mailing list public-web-perf@w3.org and GitHub Repos. Image you're visiting our W3C website, if the web content doesn't show up in the screeen within a certain number of seconds, as a user, perhaps you will just close the tab and head to alternatives. However, as a developer, you might hope to trace the hints in the requests and navigation details, so that you can find out what's slowing down this webpage. Fortunately, most browser vendors are willing to expose performance characteristics that allow developers to collect accurate performance details. These performance timing APIs, as their names suggest, are very helpful to identify the bottlenecks of the web applications from different aspects and improve the performance. Waterfall charts may be the first tool you'll think of when trying to understand the performance of your web applications. Have you ever wondered about the magic behind these graphic charts? In the following sections, we are going to explain a set of performance monitoring APIs that allow you to do more than a waterfall chart measurement. Fig.1 is a waterfall chart for the timing data for each loaded resource of a simple webpage. Actually, the [[RESOURCE-TIMING]] API can provide much more detail information than this. Fig.2 is a set of attributes that developers are able to access for each loaded resource on their Web applications. Web Applications mostly consist of a set of downloadable resources. Here resources usually refer to HTML documents, XHR objects, links (such as a stylesheet) or SVG elements. The Resources Timing data are exposed as methods on the global window.performance object we are going to talk about in the next section. You're encouraged to use the performance.getEntriesByType("resource") method to obtain an array of Resource Timing Objects for each requested resource. The PerformanceResourceTiming interface extends the PerformanceEntry interface in the Performance Timeline. 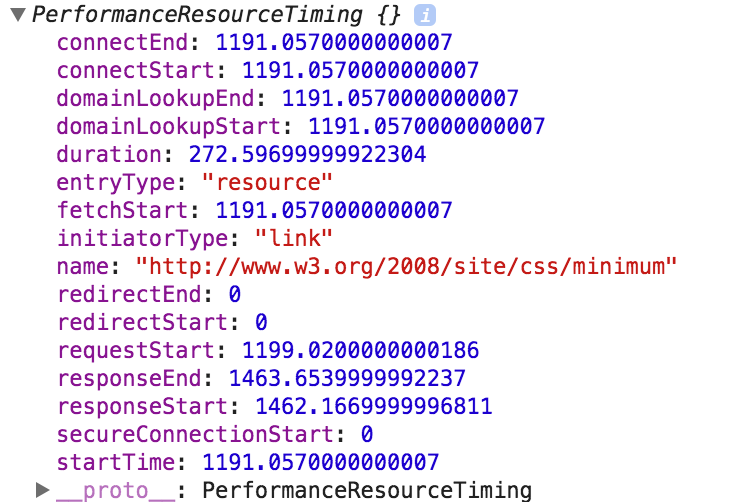 The duration attribute in Resource Timing can by measured as the difference between responseEnd and startTime. As shown in Fig.2 and Fig.3, you are able to access a set of critical network timing attributes for each resource on the page. Each of these timestamps is in microseconds, which are provided by the window.performance.now() method in the High ResolutionTime specification. As an example, let's try to measure the time it takes to fetch the icon on the W3C homepage. So far, the [[RESOURCE-TIMING]] API has been widely implemented. Fig.4 illustrates the current support data on the major desktop and mobile web browsers, please also visit caniuse.com for the latest status. Can I use Resource Timing API? You may already start thinking about, if these timing datas of the resources on the webpages are good enough to measure its performance? Right, to understand your web application, it's always necessary to explore more: page nagivation, user interaction, request-response cycle, ect. According to this requirement, the group introduces Performance Timeline, which is a unified interface to obtain various performance metrics. The Performance Timeline API uses PerformanceEntry.entryType to describe the type of the interface represented by this PerformanceEntry object, which represents performance measurements. A DOMString identifier for this PerformanceEntry object. Not necessarily unique. The DOMString that describes the type of the interface represented by this PerformanceEntry object. A DOMHighResTimeStamp that contains the time value of the first recorded timestamp of this performance metric. A DOMHighResTimeStamp that contains the time value of the duration of the entire event being recorded by this PerformanceEntry. The W3C WebPerf WG maintains a list of the known values for PerformanceEntry.entryType. All of the metrics that participate in the Performance Timeline are able to provides timing data in sub-millisecond resolution, i.e. in DOMHighResTimeStamp, which is defined by the High Resolution Time (L2) spec. In early stages of design, our Timing APIs were defined in terms of wall-clock epoch times. Unfortunately, such times on modern computer system have an unpleasant property: they are not monotonically increasing at the rate at which time actually passes. In particular, NTP adjustments, leap seconds, user configuration changes, and so forth can cause the epoch time reported by the system to go backwards, go forwards to fast or go forwards too slowly. For example, a positive number, negative number, or zero may be logged in between the two calls to Date.now(). The time values returned when calling the now() method on Performance objects with the same time origin MUST be monotonically increasing and not subject to system clock adjustments or system clock skew. The difference between any two chronologically recorded time values returned from the now() method MUST never be negative if the two time values have the same time origin. translateTime MUST be used to compare two chronologically recorded time values of different time origin. Date.now() is genuinely useful in determining the current value of the calendar time and has a long history of usage. However, looking longer term, there's a need for more precision. One example is graphics. When calculating the frame rate of a script based animation, developers will need sub-millisecond resolution in order to determine if an animation is drawing at 60 FPS. Without sub-millisecond resolution, a developer can only determine if an animation is drawing at 58.8 FPS or 62.5 FPS. The DOMHighResTimeStamp type and the now() method of the Performance interface resolve the issues summarized in this section by providing a time value in sub-millisecond resolution. Time Origin determines the time value from which time is measured. For a dedicated worker or a document the origin time is the start of page navigation of that document, and for a shared worker the origin time is when the shared worker is created. For a more accurate definition, please check the spec's details. To display such events on the same timeline, the application can translate the DOMHighResTimeStamps from the worker with the translateTime method. Now that we know how to get timing metrics for individual resources, let's go a step further to access the complete timing information for navigation of a document. Navigation Timing API is the starting point of the Web Performance APIs. 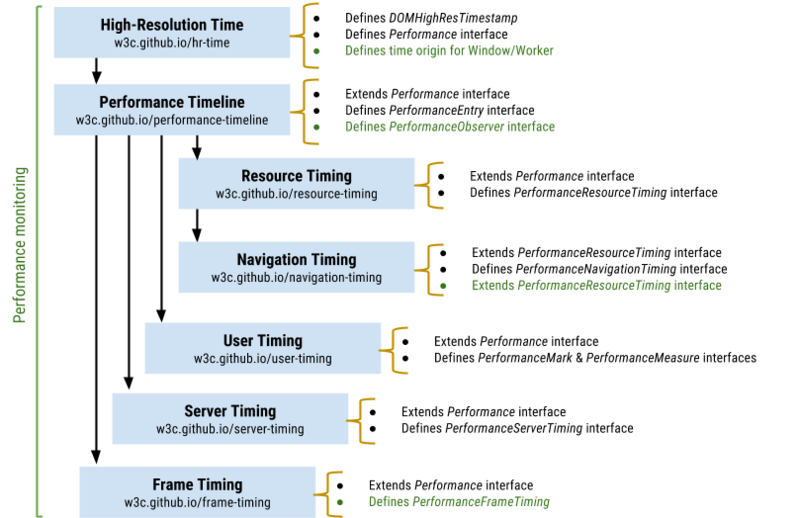 In [[NAVIGATION-TIMING]], by accessing window.performance.navigation, you will get an instance of PerformanceNavigationTiming which provides timing-related information about the page’s performance. This doesn't fit in the goal to offer a unified entry by performance.getEntries. By the time Performance Timeline APIs was introduced in 2011, the initial design of Navigation Timing has been widely implemented so it was too late to align it with the Performance Timeline. Navigation Timing API Level 2 tries to fix this historical bug by an ideal design for Navigation Timing. It participates in the Performance Timeline API, and extends initiatorType and workerStart from the PerformanceResourceTiming interface. Fig.5 displays a list of critical performance characteristics of navigation a page defined in [[NAVIGATION-TIMING-2]]. Below is a demo of navigating the www.w3.org webpage. a demo of Navigation Timing Attrbutes, generated with timing.js. Fig.7 is the support data table for [[NAVIGATION-TIMING]], generated by caniuse.com. If you are curious about the status of the latest Navigation Timing design in Level 2, the Web Performance WG has provided a detailed report (by October 21, 2015) for the latest features in its deliverables. So far, with Navigation Timing and Resource Timing, you can sufficiently access the timing information of those critical moments in resource loading and page navigation. However, what if you want to determine what's going wrong with a button-click interaction of your user? Is it possible to obtain the high precision performance characteristics of an individual task which is important to you? User Timing is an extension to the Performance interface that can help you measure the performance of your applications by providing high precision timestamps. Here's a simple example that explains how a developer can use the interfaces defined in this document to obtain timing data related to developer scripts. The PerformanceMark interface extends the Performance interface, and exposes marks to the users by a function named mark(). Taking advatage of the Performance interface, it's pretty easy to access the marks you have storaged. By calling window.performance.getEntriesByType('mark'), you will get a list of all the marks in your application. When a mark is no longer of any value, you can get rid of it by clearMarks('name'), or even clear all the marks with clearMarks(). When you have prepared enough marks, the PerformanceMeasure interface can help you calculate the elapsed time between two marks. This interface is also an extension of the Performance interface, which exposes measures created via the measure() method. Here, measure() stores the DOMHighResTimeStamp duration between two marks along with the associated name (a "measure"). For example, to measure a successive click, we can call window.performance.measure('measure_click', 'click_before', 'click_after');. Similar to the PerformanceMark interface, you can get measures by simply calling window.performance.getEntriesByType('measure'), and use clearMeasures() method to delete measures. Nowadays, you are able to use User Timing API on most of the major browsers. Please visit caniuse.com for the latest browser support information. Can I use User Timing API? Most of the above Web Performance Timing APIs are still work in progress. Fig.9 is an overview of the current plan of the Performance monitoring specs within the Web Performance Working Group. 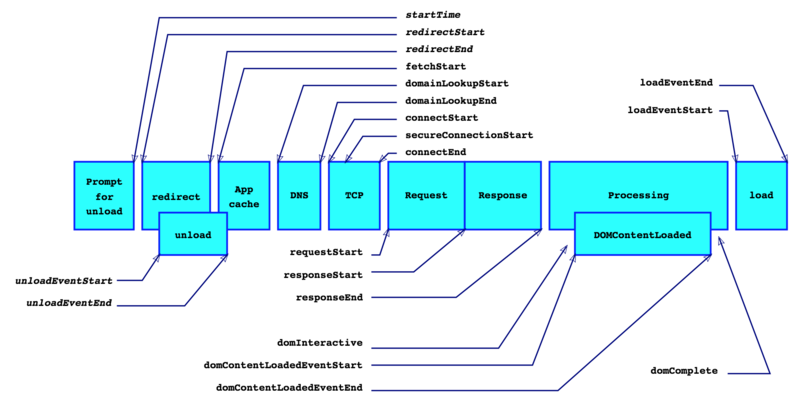 Web Performance Monitoring APIs Overview, by Ilya Grigorik. This roadmap might already give you some ideas about the potential areas that the WebPerf working group is exploring. In the future, developers will be able to collect much more performance details to improve their user experience. Being designed for the communication from server to the client, Server Timing consists of two parts: a definition of the Server-Timing header field and a PerformanceServerTiming interface which participates in the [[PERFORMANCE-TIMELINE-2]]. More details and use cases can be found in the spec ([[SERVER-TIMING]]). The idea of a "frame" comes from the event loop of the browser processing model. To provide an interactive user experience, the browser processing model runs a continuous event loop at a certain update frequency - e.g. 60Hz refresh rate. If all of the work within each execution of the event loop (i.e. within a "frame") is completed in the allotted time budget (e.g. 16.6ms for 60Hz refresh rate), the smoothness will meet the user's expectation. Otherwise, if one or more frames are skipped, it will result in inconsistent response, processing, and rendering times, which hurts the user experience. The Frame Timing API is very helpful to developers who want to deliver a smooth and responsive user experience. It defines an interface for web applications to access runtime performance information of the browser event loop, enabling them to identify and fix issues that cause delayed rendering, processing of input, and other critical work necessary to deliver a smooth and responsive user experience. This API also participates in the [[PERFORMANCE-TIMELINE-2]], with a entryType value as "frame". Resource Timing and User Timing have been useful to provide performance data, but in some occasions, it's tricky to make use of this data if there's no notification when new performance entries have been recorded. In [[PERFORMANCE-TIMELINE-2]], the PerformanceObserver interface was introduced to solve this problem. This interface makes it possible to subscribe to / observe new performance events delivered into the Performance Timeline. Special thanks to all the participants of the W3C Web Performance Working Group for their brilliant ideas to make the Web faster. We're also grateful to the contributors on GitHub who made this document more readable, and helped to keep this primer in sync with those specs still work in progress.